The Eugene Applebaum Dare to Dream grant program moves University of Michigan students through the business creation process by offering business development seminars and awarding $500-$5,000 in grants to individuals and/or student teams. The program requires students to submit deliverables as they are guided through the business development path from a nascent idea to formulating and assessing potential businesses to planning and launching these businesses. The grants program has three phases and students may enter their business into the program at any phase. Once entered the business cannot re-apply for the same phase or a phase before it. Support for the Eugene Applebaum Dare to Dream Grant Program is provided by Eugene Applebaum, founder of Arbor Drugs, Inc. and president of Arbor Investments Group. Support for the Mayleben Family Venture Shaping Grants is provided by Tim Mayleben, CEO and president of Aastrom Biosciences, and his wife Dawn Evans. Applications for the upcoming 2019 Winter term Dare to Dream program are availble now. The deadline for these applications is Friday, January 25, 2019 at 8 a.m. Join us for an information session at the Ross School of Business on January 15. Contact Dare2Dream@umich.edu for further information. 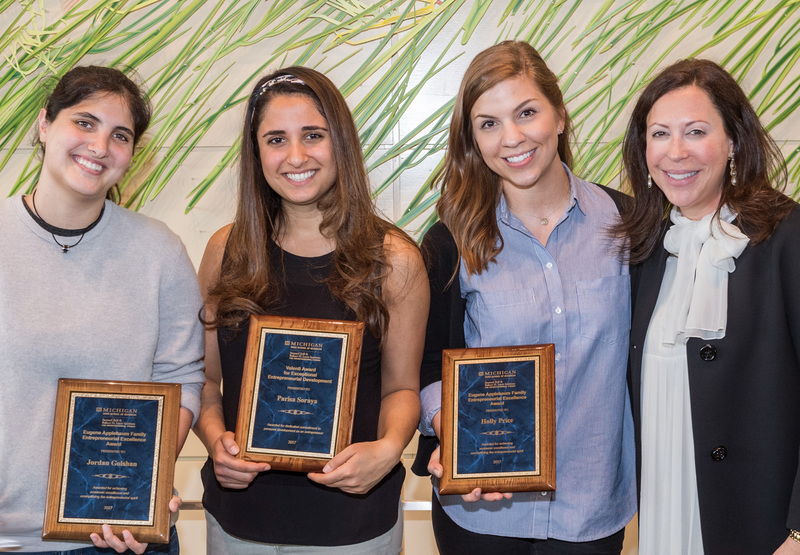 The Mayleben Venture Shaping (Phase I) grant program takes University of Michigan students through the process of constructing a viable business out of a business idea - a differentiated, sustainable venture that holds commercial promise and that can be launched. Once the business construct is completed, teams may apply for a Dare to Dream Assessment grant to evaluate the feasibility of their business. Applications are due at 8 a.m. on January 25 for the winter semester. Information on applying will be shared at the Dare to Dream information session on January 15. Download the application here - please read and follow the application instructions carefully. Awardees are required to attend office hours and two workshops (Developing Your Business Model Canvas and Conducting Effective Customer Discovery) and will receive up to $500 once the deliverable (a Business Construct) is completed and approved. The process will help to generate a business construct that states what the final product is, who the customers are, and where the venture fits within the value system. The business construct can be submitted to apply for a Dare to Dream Assessment (Phase II) grant. The Venture Shaping deliverable is due by April 15, 2019. Open to University of Michigan (Ann Arbor campus) students only. The Eugene Applebaum Dare to Dream Assessment (Phase II) grants are for student teams with a proposed business that is selling a unique product or service with a clear market need. During the assessment process teams will establish the feasibility of their business in order to gauge whether or not to invest further resources and commit to launching the venture. Once this is established, an Integration grant encourages the creation of a full business plan. Applications are due at 8 a.m. on January 25, 2019 for the winter semester. Information on applying will be shared at the Dare to Dream information session on Tuesday, January 15. Download the application here - please read and follow the instructions on the application form carefully. Awardees are required to attend office hours and three workshops (Identifying & Sizing Your Market, Assessing Financial Feasibility, and Startup Financials) and will receive up to $1,500 once the deliverable (a Feasibility Study) is completed and approved. This will evaluate the market, the financial concerns of the industry, and specific team issues. The feasibility study can be submitted to apply for the Eugene Applebaum Dare to Dream Integration grant. The Assesment deliverables are due by April 15, 2019. Open to University of Michigan (Ann Arbor campus) students only. During the Integration (Phase III) grant process University of Michigan student teams will write a business plan and create an investor pitch. Applications are due at 8 a.m. on January 25, 2019 for the winter semester. Information on applying will be shared at the Dare to Dream information session on Tuesday, January 15. Download the 2018 application here - please read and follow the instructions on the application form carefully. Awardees are required to attend office hours and three workshops (Startup Financials, Startup Funding for First Time Entrepreneurs, and Communicating with Investors) and write a complete 10-page business plan. Grants of up to $5,000 are provided upon completion of requirements. The final business plan is due by May 20, 2019. Open to University of Michigan (Ann Arbor campus) students only. You need a current University of Michigan (Ann Arbor) student on the team to apply for any phase. Diverse teams are more favorably reviewed. 4. What kind of businesses are you looking for? 5. What is the benefit of applying for Venture Shaping (Phase I) instead of Assessment (Phase II)? 6. What if the Feasibility Study shows the idea is NOT feasible? Your team will still receive the grant money as long as the study is completed properly. For more information, please refer to the information sessions slides in Canvas or contact Dare2Dream@umich.edu.